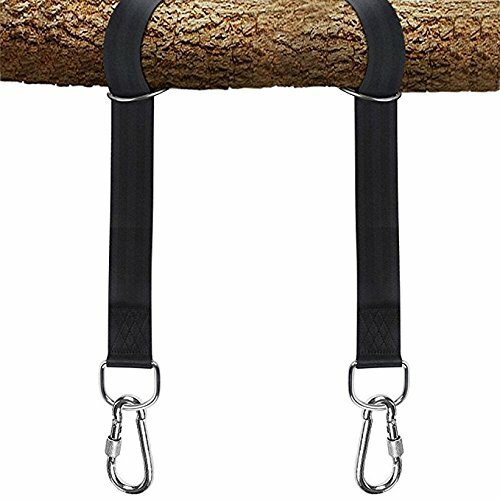 Practical Tree Swing Hanging Strap Kit from Trendy Lovers. So what are the ADVANTAGES of our Hanging Straps ? - Non-stretch 100% polyester + stainless steel carabiners and D metal ring.It is able to holds near 2000 lbs. It is safe enough for your kids and most of the adult. One more point, you can install it within 5 minutes, no drilling or tools needed. Just have fun. -These 2-inch wide Straps Installed Swings or Hammocks without damaging the trees. It is eco-friendly to the trees and nature. It will bring you a happy experience. -Tree Swing Hanging Kit Fits all Hanging Swings and Hammocks: patio swings, porch swings, hammock chairs, baby carrier swings etc. -These straps are perfect to hold a swing or hammocks to any indoor or outdoor location. Or any seasons.